The Bahamas is an archipelago of more than 3,000 islands, cays and islets located just north of Cuba and the Caribbean. It is only 53 miles off the coast of Florida, making it the U.S.'s closest neighbor without a land border. It is famous for its natural beauty, shallow turquoise waters (which are world class for sailing, fishing and boating) and endless unspoiled beaches. Climate is also a big appeal here. It is not quite as hot as the southerly Caribbean islands in the summer, but there has never been a temperature below freezing recorded here. 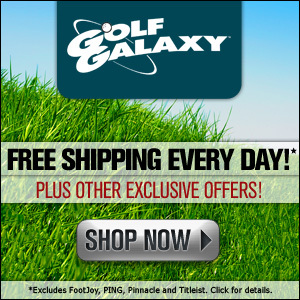 There are a lot of appeals to the Bahamas, but golf has never been one of its strong points. Baker's Bay and Tom Fazio hope to change that. 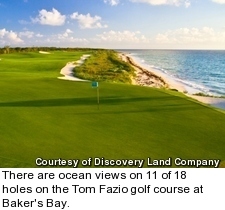 Baker's Bay Golf & Ocean Club is located on the northern end of Great Guana Cay in the Abaco Islands. Abaco is the northernmost province in the Bahamas and sits just 150 miles from the Florida coast. 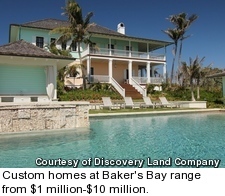 Baker's Bay is a project of the Discovery Land Company, one of the world's premier developers and operators of high-end, family centric private golf communities. The site occupies about a third of Great Guana Cay and includes more than six miles of stunning white-sand beachfront with sweeping views of the Atlantic Ocean and Sea of Abaco. The Sea of Abaco is the boating capital of the Bahamas thanks to calm waters and countless inlets and empty cays. One highlight of Baker's Bay is a full-service, 200-slip, deep-water marina that is capable of handling yachts up to 250 feet long, with dry dock facilities for residents. The Marina Village alone is as well amenitized as some golf communities, spanning about 33 acres with a general store, farmers market, traditional laid-back Bahamian bar & grill and the Harbor House Inn, with lodging and a more upscale restaurant. The Inn is not open yet, but most of the other facilities here are, including the marina, bar, restaurant and fitness facilities. For those more interested in water sports than golf, the Inn will be surrounded by a "cottage colony" of two-to-four-bedroom villas, all within walking distance of the marina and beach. 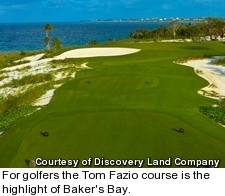 For golfers the highlight is the Tom Fazio course, the first in the Bahamas by the man often referred to as the greatest living golf architect. 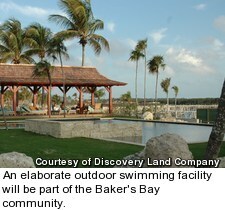 It is private for members and guests of Baker's Bay. Stretching more than 7,200 yards, it is close to the waves with ocean views from 11 holes, reaching the very edge of the coast on Nos. 8 and 9, the latter being a 215-yard par 3 across an inlet of crashing surf. The height of land at No. 13 sits 60 feet above the water and offers panoramic 360-degree views, while the course finishes in Pebble Beach-style with five dramatic cliff-top holes running back to the clubhouse. The development is high end. It includes 285 estate sites for custom homes, ranging from a quarter acre to more than two acres at a cost of $1 million-$10 million. There are also 75 developer built homes, including 35 Marina Village cottages that run $2 million-$5 million, and 44 waterfront "boat houses" with private docks that start at $5 million. There is no condo or entry-level product here. 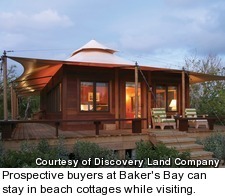 There are just a handful of completed homes so far, but the clubhouse and outdoor pursuits are being operated from temporary buildings, and there are beach cottages for prospective buyers to stay overnight while visiting. The huge golf clubhouse will include a top-of-the-line, resort-style spa, state-of-the-art fitness center, extensive men's and women's locker rooms, pro shop, an elaborate outdoor swimming facility, several restaurants and a tennis center. There is also a five-acre public beach park, a 70-acre nature preserve, a separate beach club and a branch of Discovery's signature Outdoor Pursuits Program, offering everything from snorkeling expeditions to guided bonefishing, a sport the Bahamas is known for around the world. The second-toughest thing about Baker's Bay is getting there, since visitors fly into either nearby Marsh Harbour or Treasure Cay and need to get the rest of the way by boat, either their own or one of the club's high-speed watercraft -- complete with cocktails and gourmet snacks en route. The toughest thing about Baker's Bay -- is leaving.